I love this time of year. I have always written a ‘Year in Review’ letter to family and friends highlighting the crazy things I have been up too and stuffed that letter inside a Christmas card. With the advent of so many social media channels I find that I really don’t have to recap my year because everyone has come along for the ride. However, this is my first year with a blog and sometimes I want to tell my story in more than 140 characters or have more connection than just filling an album with pictures. There are stories behind the pictures that just need to be told, and memories that I want to expound on beyond a tweet. This was quite a year. As 2012 ended we had thought we would be in Panama for at least two years but things changed quickly and we realized that our time in Panama was at an end. It was while we were leaving that I came up with an inkling of an idea and we turned our lives into The 6 Monthers; a concept where we would stay 6 months in every country we wanted to live in. Six months allows us to really get to know the locals and to explore more of the country on a completely different basis than just being on a two-week vacation. So our adventure began. I started out looking for countries where we could live for 6 months on our regular visas and while there are some, not all the countries we want to live in allow it. Those that don’t we will deal with them on a case by case basis. I also began in 2013 to work on obtaining dual citizenship for Italy which we hope will help with our request to stay someplace longer than 3 months. Leaving Panama we looked north and decided on giving Mexico a try. Other than stopping in various Mexican cities during cruises I had never spent any real time in Mexico. Arranging our time in Mexico was easier than I expected and we found the ideal location to begin 2013 in Cuernavaca. Mexico was a nice surprise and nothing like what the news media would have us believe. We never heard a gun shot and we never felt unsafe. We met nice people and we ate wonderful food. We visited amazing places and loved every second of our time there. Yes Mexico has its challenges but there is nothing about Mexico that should stop someone from exploring this beautiful country. We returned to the US for a short period to exchange clothing and to clean out the last few boxes of items we had left in my parents’ garage. We then packed for our move to Scotland. Hindsight they say is sometimes best and sadly living in Scotland was not the dream that I was hoping it was going to be. Being ever alert to prospects for new adventures, and wanting to build our 6 Monthers brand, earlier in 2013 I had connected via LinkedIn with the manager of Dhar Media in Zagreb, Croatia. They were looking for journalists interested in exploring Croatia and filming a web series called Discover Croatia. Filming was scheduled for the month of September. September couldn’t come fast enough and while our 24 day filming schedule was grueling our time in Croatia was fun and filled with great contacts and new friends. But we returned to Scotland because we had prepaid our six months rent. 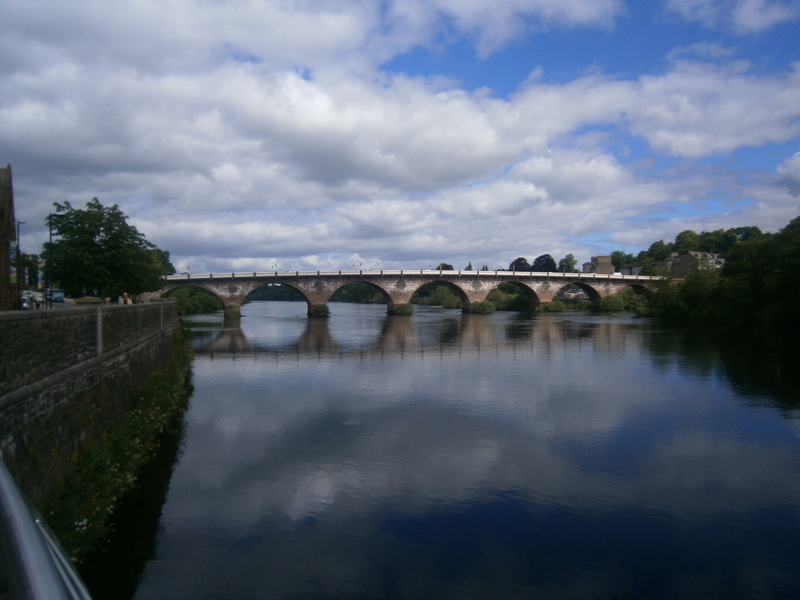 We were however increasingly unhappy in Scotland and wanted to leave. The people were not friendly or in some instances unkind. I received more than one look from strangers where I just felt that if anything happened to me on the street no one would help me. The weather was turning colder and the costs to heat our small apartment that had no TV, no internet and no elevator was getting to be ridiculous. We talked with our landlady who would not return our money since she said the banks didn’t allow money to flow in reverse but that if we found someone who would take good care of the place we could sublet to them. And the hunt was on. I told Mike I was determined to find someone to get us out of Scotland. He wanted to know where we wanted to go. I told him Sibenik, Croatia. He was surprised since I have family in Sicily and they could have arranged a place for us to stay, even on short notice. Luck was on our side, or fate intervened, and we left Scotland without looking back on October 26th and landed once again in Croatia. Since we had already spent 24 days in the country we were only allowed to stay in the country on our regular visas until early January 2014 but we didn’t mind. 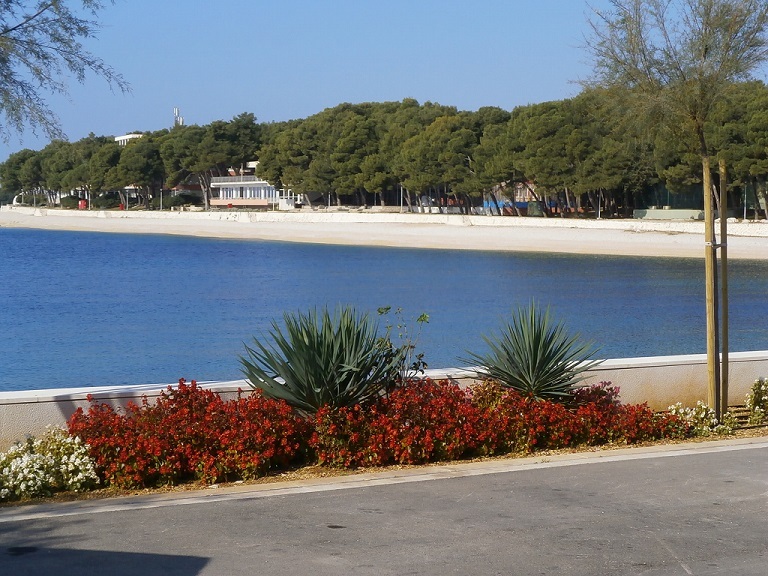 We found a great apartment to rent in Sibenik for 2.2 months and we grabbed it. We connected with several locals who toured us around and we learned more about this region and this country. To thank everyone we had met and who treated us so warmly we threw a Holiday / 6th Wedding Anniversary party. It was a happy event and we are glad that we did it. Holidays in other countries are always interesting because so many customs and traditions are different from our own country. Here in Croatia they celebrate St. Nicholas day (December 15th) and the Epiphany (January 6th) which hold just as much significance as the main event; Christmas. New Year’s Eve is yet to come but we already know there will be parties to attend and more stories to file away. So while 2012 ended on a sour note we turned 2013 into a time of new beginnings, new friendships and new memories. After all, isn’t that what the ball drop on New Year’s Eve represents? Isn’t this why everyone cheers and sings and toasts the coming year? New Year’s Eve is a time to say goodbye to the past and to look forward to the future. New Year’s Eve is a time to make a toast to the coming year’s possibilities and a time to sing to let the world know that you are coming. This December 23rd was our 6th wedding anniversary. The modern symbol for this anniversary is iron which is strong, long-lasting and represents the strength of the marriage bond. To us however we viewed this as a way to celebrate the strength of the friendships we have formed over these past few months. This party was therefore a two fold event; 1.) It was to help us celebrate the Holidays, and 2.) We used it as a vehicle to invite everyone we knew in Croatia to thank them for their support and friendship over these past few months. Coming up with a list of 30 people who we wished to invite we sent out invitations and we had a wonderful response. We planned the party for 1:00pm on a Saturday and 25 people said they would attend. We found a restaurant to hold the event and hoped for the best. We had good friends who drove 3.5 hours to attend who came all the way from Zagreb (thank you for driving Slavisa). 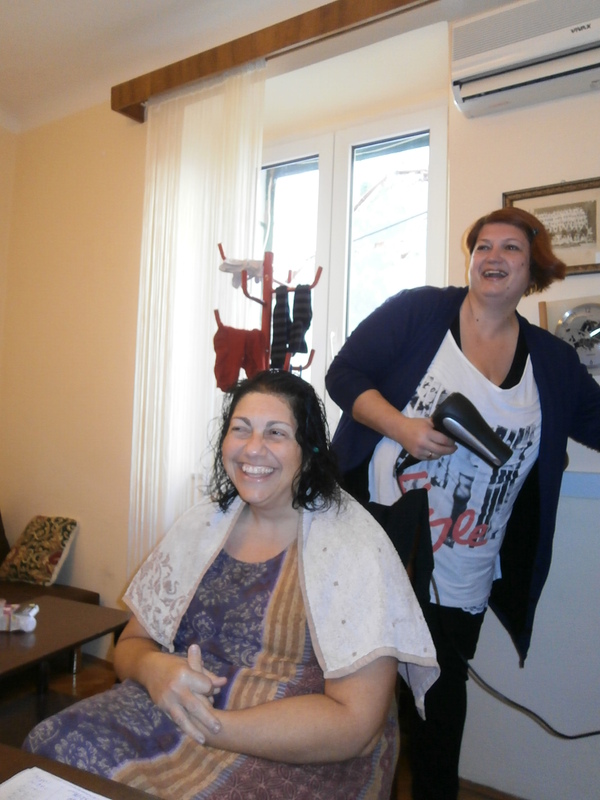 Our landlady Nina come over to the house early that morning to fix my hair and even to give me my first dye job (as in…I want to wash that gray right out of my hair). 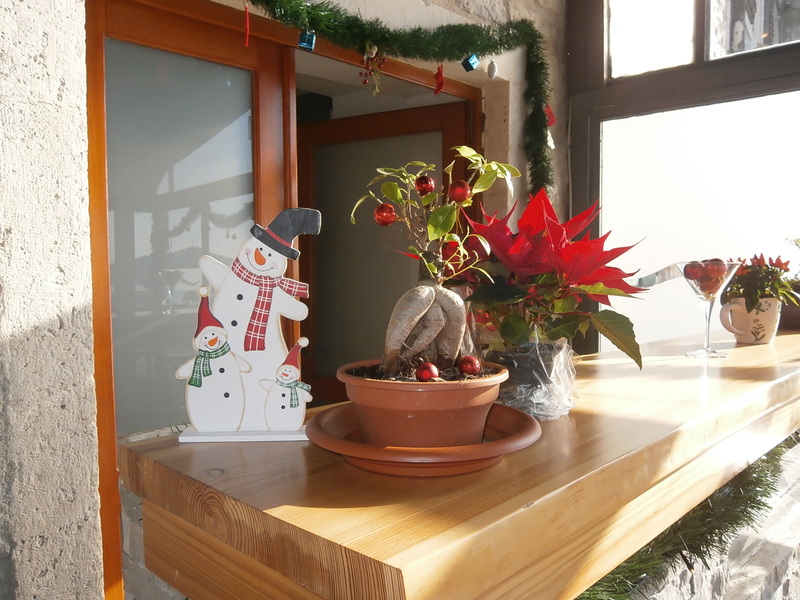 We bought poinsettias to decorate the tables and they were such a hit since we gave them to some of the woman who attended the party to take home with them. We had lots of good food, homemade cookies for dessert and dancing in the streets (well inside the restaurant but it sounded better the way I wrote it). We had also been told that Croatians would stop in for a couple of hours and not to expect the party to go on much past 6:00pm. By 9:00pm we were still sitting around, dancing, talking, and having a great time. So yes, we think this was a very successful event. From left; Slavisa & Lea (owners of Dhar Media), Mike, Manuela and Me. These are the people who brought us to Croatia to film the web series Discover Croatia, and discover it we did. 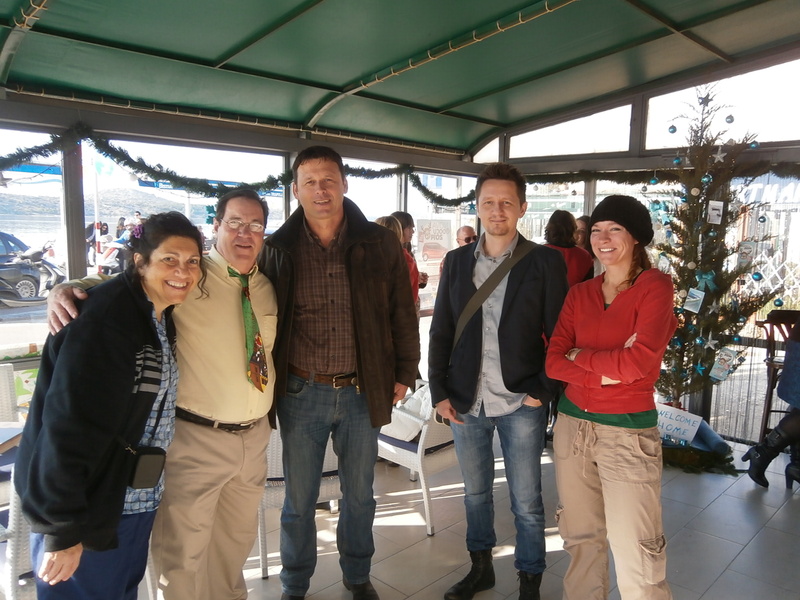 From left; Our own Personal Insider – Biljana Lambasa; Tina Vickov, owner of Sibenik Plus Tourist Agency, Mike and Me. 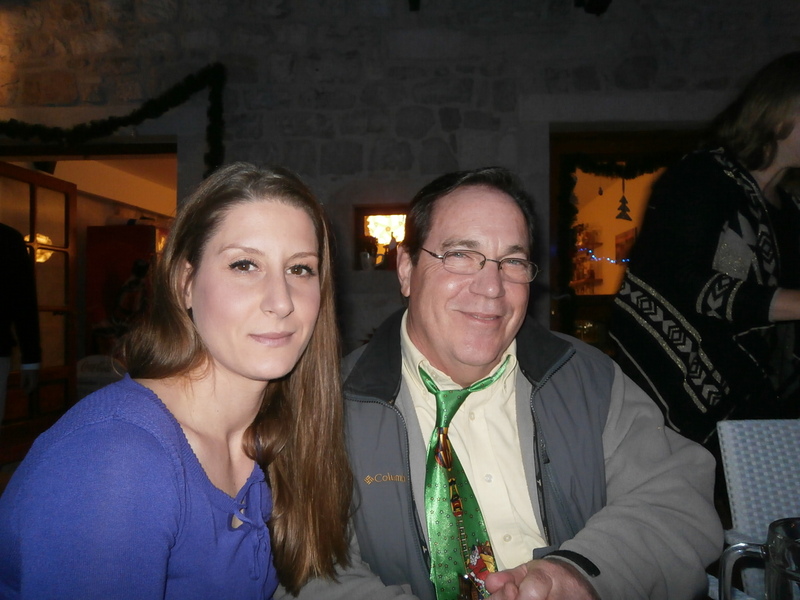 We were in good hands with these two who showed us the Sibenik we called home. We wouldn’t have learned as much without them. From left; Marjan our landlord (Nina’s husband) and Steve Gundic who toured us around Krka National Park and Burnum the Roman gladiator town. As we make our plans to leave Croatia for our time in Spain we know we are leaving behind good friends. And we are not sad. You see we know we are not really leaving them behind. We will be taking our memories of our time here everywhere we go and comparing other countries and its people to Croatia. The other countries have very big shoes to fill indeed. In the early 1980s I began to hear about a little town in what was then Yugoslavia called Medjugorje. I couldn’t pronounce the name of this town let alone spell it. 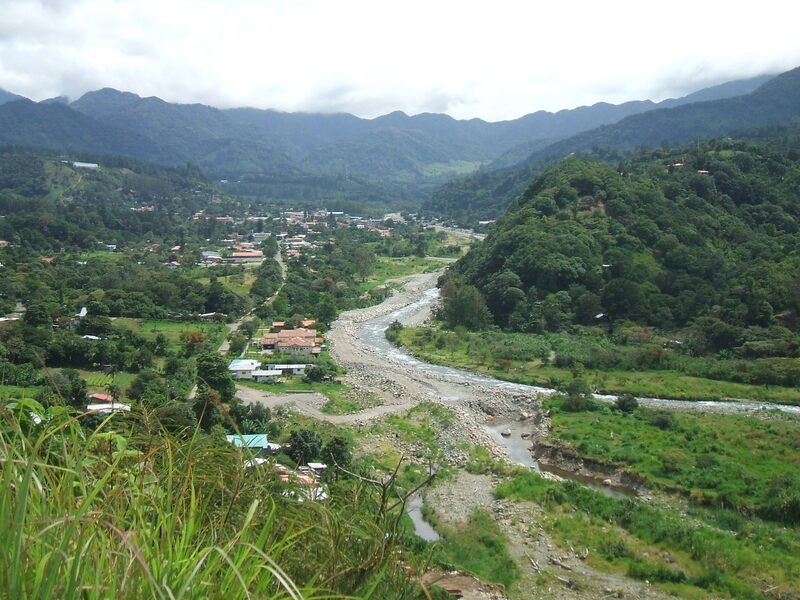 The reports coming from this little town however fascinated me and I wanted to know more. You see I’m not only Italian American but also Roman Catholic. As a Catholic I had grown up with stories of saints and apparitions of our Blessed Lady in both Fatima and Lourdes but these apparitions were happening during my lifetime. Somewhere in the back of my mind I always kept the story of this town and I vowed that one day I would go there myself and see what I could see. Years passed, as life has a way of doing and war came to Yugoslavia. Even during those war years I often wondered how the people of this town were fairing and if our Lady had indeed prepared them for the worst. The war ended in 1995 and seven new countries were formed; Albania, Croatia, Kosovo, Macedonia, Montenegro, Serbia and Bosnia-Herzegovina, which is where the town of Medjugorje is. It is pronounced med-ju-gor-e, pretty much the way it is spelled. The town rests high in a hill, 40 minutes south of the city of Mostar in the southwest region of the country. Getting to it by bus isn’t easy and the ride from Croatia took about five hours. Once you arrive in town at the bus station you must walk past souvenir shops selling religious medals, rosaries and statues; you will also walk past restaurants and hotels. My husband entered one of the local restaurants to ask a few questions and as he turned to leave the waitress said, “Be sure to see the statue of Christ beyond the Church, it weeps”. And so it began. 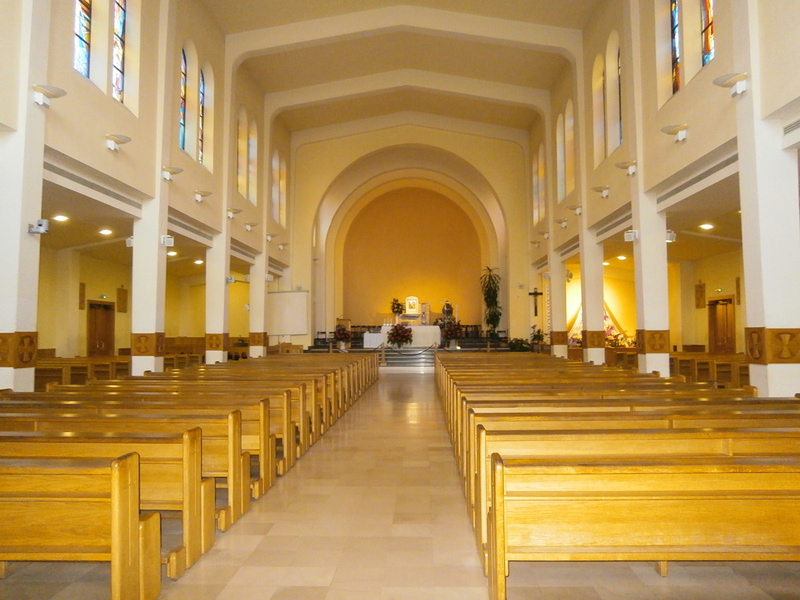 The complex in Medjugorje is like nothing I have seen before. There is the main church which seats 500 or more people. There is the outdoor chapel area which seats 7,000. There is the area for lighting candles for your special intentions; prayer altars along the path to the cemetery and if you feel the need to go to confession you can do so in about a dozen languages. They hold mass every hour of the day from 10:00 to 6:00pm and every hour the mass is in a different language. There is the cemetery; apparition hill, and that Statue of Christ. 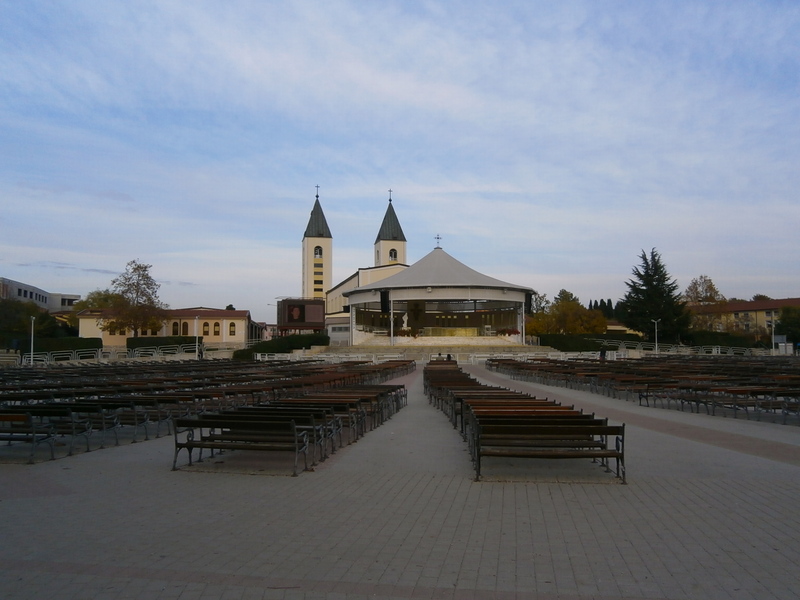 We were told that upwards of a million people come to Medjugorje every year. They have been coming since the apparitions began and they came even during the war. I first entered the main church and found only one person inside. It is a plain but beautiful church and the second I opened my mouth to say my first prayer I began to sob. The strong feelings overcame me so quickly I couldn’t pray for that which I had come to pray for, at least not out loud. My husband told me that God didn’t need to hear the words; he knew what was in my heart. It was still hard not to be able to say that which I had held in for all these many years. Leaving the church we went next to the area where the Statue of Christ rises. The Statue was erected in 1989. It is made of Bronze. And almost immediately after it was put into place people noticed the liquid running down its leg. Walking towards the statue of Christ I again was overcome with emotion and began to cry. There is a step stool for people to get closer to the statue to see the liquid running down his leg and if I hadn’t seen it for myself I know I would be reading this with skepticism and I asked my husband how could this be? I had to touch the liquid for myself and as I wiped it away another tear appeared and then another and again I began to cry. It is hard to explain the deep emotion this place brought forth from me. We were there for 6:00pm mass this night and walking back to the church we saw buses arrive bringing more people in to attend mass. It was a Monday night in winter; cold and dark; and there wasn’t a seat to be had inside the church, people had filled the pews and it was standing room only. Because the church was so full there were six priests on the altar during mass and everyone was needed to give out communion. Almost everyone in the church received the sacrament. Normally, when a mass finishes people begin to flock out the door; this night however no one moved for a prayer service began after the mass and most of the people stayed to continue praying. After the prayers the priest blessed any of the religious items purchased that day in the gift shops, and even after that people stayed to keep praying. We left only because we needed to catch our bus to Mostar. My husband who is not a religious person told me that he feels that something special is happening at Medjugorje; what it is exactly we couldn’t put our finger on, its just something you feel, and see, and believe. As for me I cannot explain the deep emotions that overcame me on this day. I have been trying to sort that out. I wasn’t crying out of sadness or grief, I was crying because the presence I felt was so strong that I was overcome with emotion, and hope. I still light candles in churches I visit in other places but I feel somehow that I’ve already lit candles in a place where my prayers will be answered, even though God had to hear them from my heart. 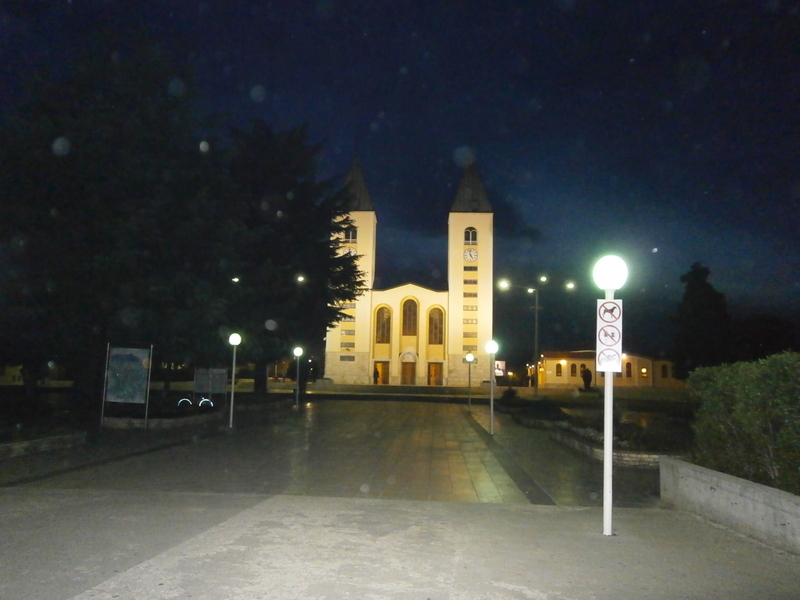 Click this link to read more about the apparitions in Medjugorje. We have been very blessed this year to have met people from all over the world. Here are some of the many languages they speak and how they say Merry Christmas. May the world have peace in 2014. One of the pluses of our lifestyle is that we know we only have 6 months to explore any given country and we take advantage of every opportunity to get out and see something new. Mike and I are constantly making connections with new people. We talk a lot to strangers in stores and restaurants and in the grocery store line. You never know when a contact will give you information on a great ‘must see’ or even connect you with a person who can provide a wonderful trip experience. One of our latest adventures came about via a contact here in Sibenik which led us to an all day tour of some of the places we had not seen before right here in our own backyard. Our day began in the lovely little village known as Primosten. This little town which is 27km from Sibenik has 3000 residents and was mentioned as far back as the 5th Century. The city is known for its pristine beach’s and its vineyards. The famous Babic wine is grown in this region. The graceful St. George’s Church, built in 1485, can be found high on top of the hill overlooking this town which affords a magnificent view of the seven islands that surround the city. Primosten used to be an island as well but during the Turkish invasion in 1542 the islet was protected by walls and towers and a draw bridge connected it to the mainland. When the Turks retreated the moat was replaced with mud and dirt and the gap between the islet and the mainland was closed. The old stone walls protecting the city can still be seen today. Primosten is a wonderful place to walk; the streets are small and narrow and when you are ready there are 50 restaurants to choose from (many only open during high tourist season). 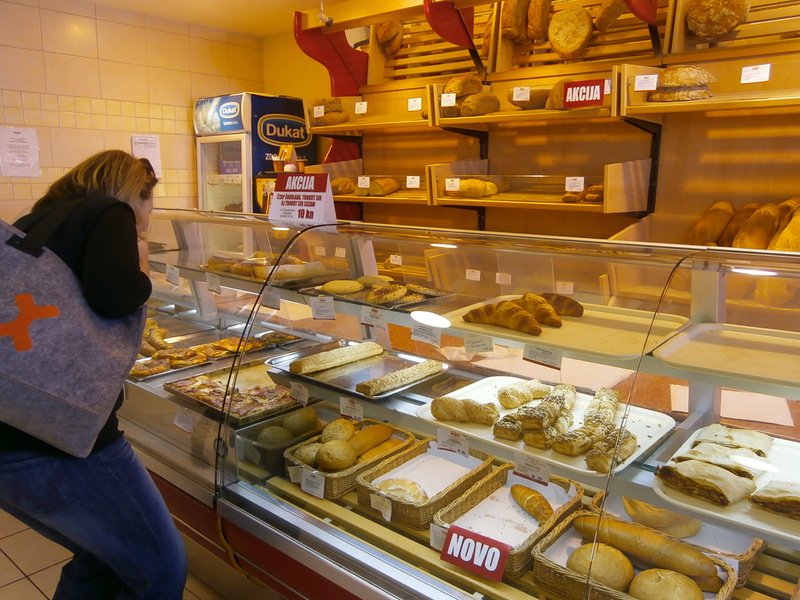 We did find the local bakery in full operation and the smell of fresh baked goods wafting along the streets was enough to make us stop in and sample just a little something. For those of you who like more of an adventure an all over body tan can be had at the beach called Smokvica which is one of the few nudist beach’s here in Croatia. A tour of this area would not be complete without a stop to look at the way the wine grapes are cultivated here. The grape vine is planted in compartments separated by little stone walls built in the technique of “suhozid” (dry wall technique). The soil here is so rocky that about 150 year ago planters moved the rocks out of the way and formed them into small compartments leaving enough soil to plant grape vines. This led to this beautiful hill side covered with compartments and inside those compartments are thousands of grape vines. The red wine grape produces a wine called Babic which is quite famous, and quite good tasting. 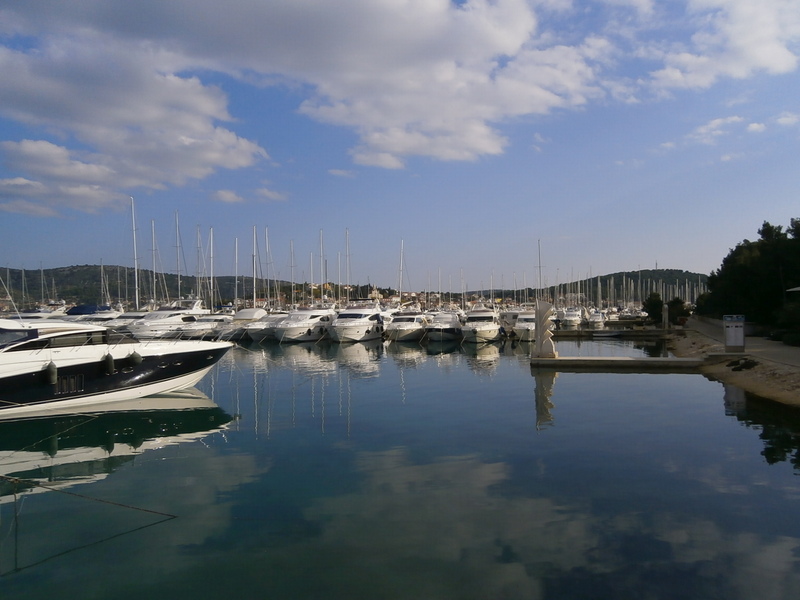 Our next stop was to the Marina Frapa, one of the most exclusive marinas in Croatia. It is situated in the central part of the Croatian coast, between Šibenik and Split, in the heart of Dalmatia in Rogoznica. The parking lot is monitored and only invited guests are allowed to explore the grounds, eat in the many dining rooms, dance the night away at the local nightclub, use the swimming pools and the wharf, or even shop at the local grocery. Most of the 500 berths here are full year round. All this driving around and exploring made us hungry and our last stop of the day was our most unique stop, and a surprise put together by our hostesses. We lunched at the ethnic restaurant Saricevi Dvori owned by Zoran Saric. The building the restaurant is in has been in Zorans’ family for over 400 years. On the land he grows the fresh vegetables he puts into all his dishes. 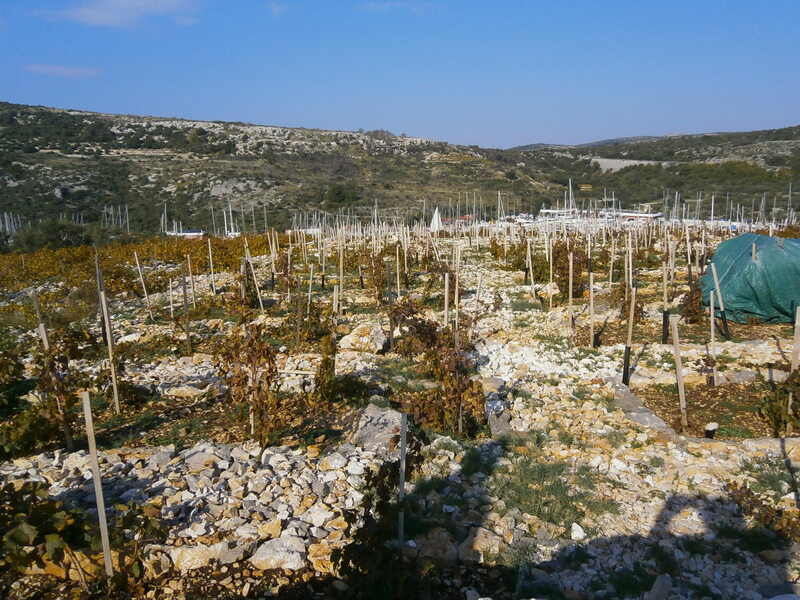 He grows his own grapes and makes his own wine (very much a Croatian tradition). He grows his own olives and presses his own olive oil. Zoran even cooks meals the traditional way, over an open fire and using a ‘peka’ to cook the main meal and the bread that accompanied our meal. 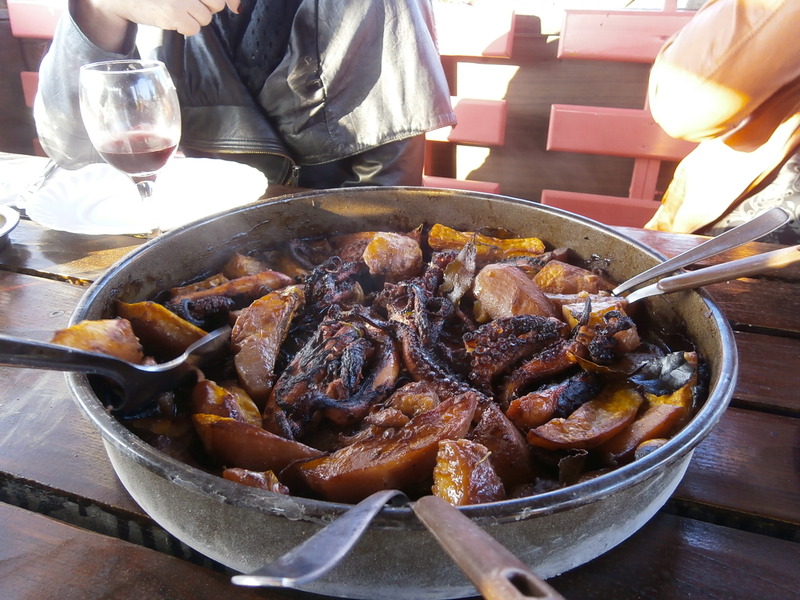 A peka is a round metal dome buried under burning and incredibly hot embers which uses the heat from the fire to cook what is placed under the dome. This day we were served baked octopus and roasted potatoes and my husband tells me it was the best octopus he has eaten while here in Croatia. Zoran makes his own rakija (a local Croatian aperitif which comes in several flavors) and he proudly served us some as a welcome to his family home. 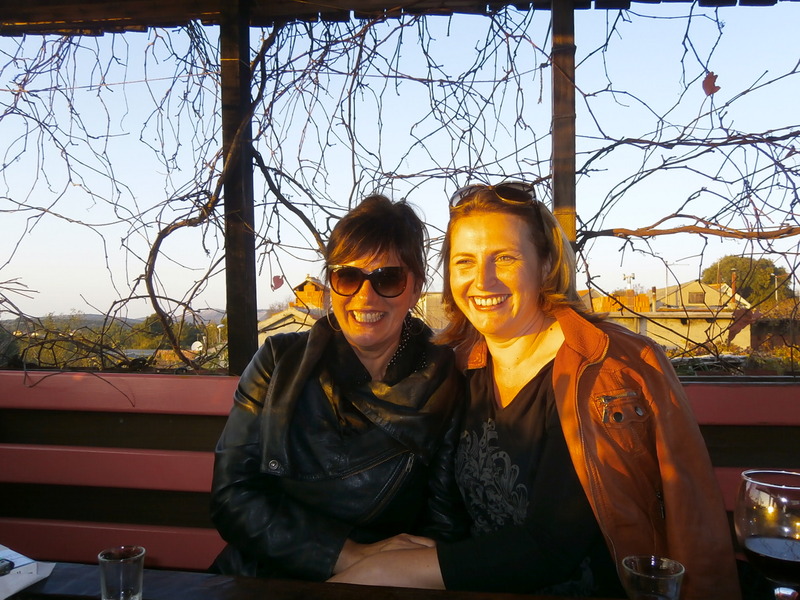 There are several areas to sit at Saricevi Dvori and we opted for the loft dining section which gave us a spectacular view of the sun as it was setting while we dined, and drank wine, and enjoyed a very traditional Croatian meal. There is no better way to end a great day than with a good meal. Our thanks go to Tina Vickov (owner of Sibenik Plus Tourism Agency), and Biljana Lambasa (owner of Personal Insider) for designing our trip and accompanying us. We love exploring new places, but we love connecting with people and making new friends more. Cheers! As expats who are usually not home with family and friends during the holidays we have always tried to immerse ourselves in the culture and the traditions of the country we have adopted during our 6 months. As Christmas approaches instead of feeling sad or missing our families we look around and see what traditions or holiday events we can attend in our new country. In doing this we have enjoyed multiple Independence Days, May Day festivities, and feast days for many saints, among other holidays. In Croatia one of their national holidays is the feast day of St. Nicholas. St. Nicholas is the Patron Saint of sailors and fisherman and his feast day is December 6th. Yes, this is the same St. Nicholas that is Father Christmas (Santa Claus) and children do receive small presents on this day. Since the town of Sibenik sits on the waterway that leads from the Krka River to the Adriatic Sea many people here make their living as either sailors or fisherman. There stands in the old part of town a tiny Church honoring St. Nicholas which is only open for three days every year. 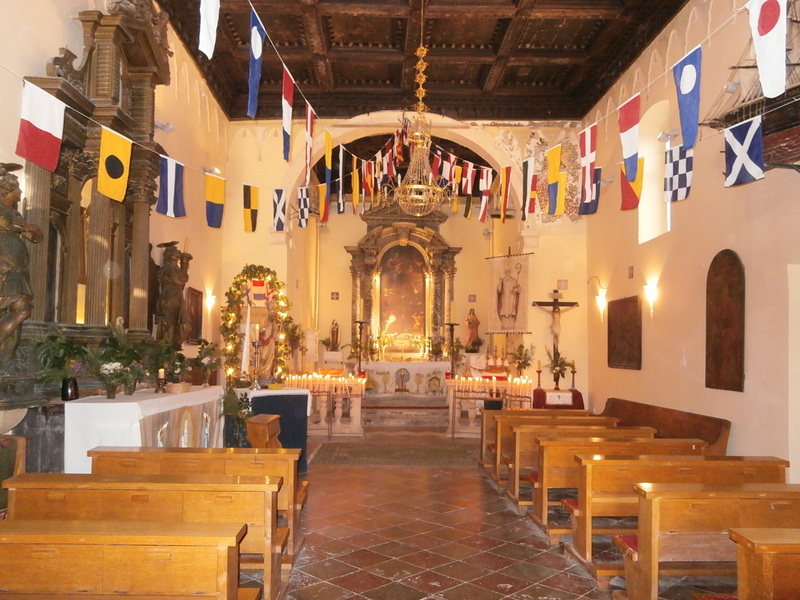 The church is decorated with nautical flags and model boats are hung from the ceiling. These boats represent the boats that will run in the Sibenik Regatta, an annual boat race held to celebrate the Feast of St. Nicholas and to give him thanks for another safe year of life on the water. Boats come from Italy, Slovenia and Croatia to participate in the race all for the first place prize of a trophy. This year the race was run on December 7th and Mike got to ride on one of the boats and to help with the yeoman’s work of keeping the boat from keeling over. 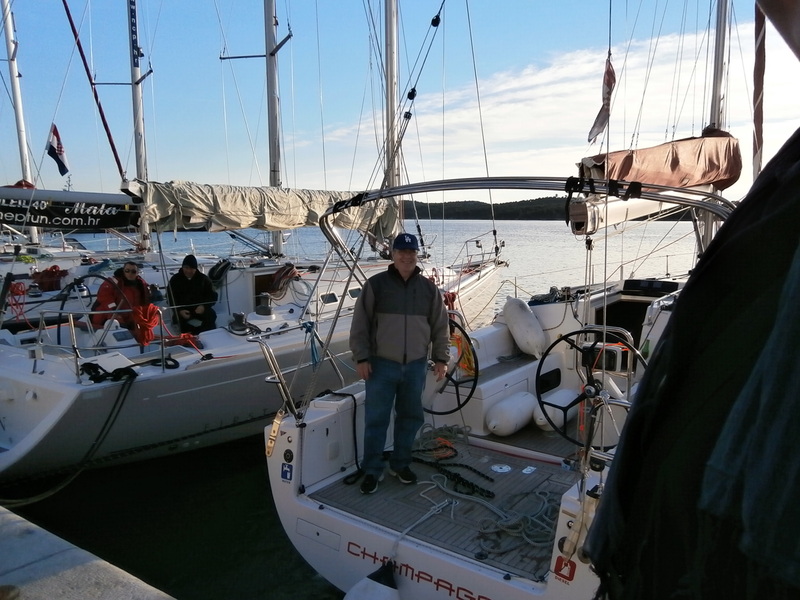 There were 35 boats in the race and Mike was part of a four-man crew on a boat called Champagne. I opted to be on the much larger and much warmer observation boat (okay I partied on a yacht) while taking pictures of the boats in the water. 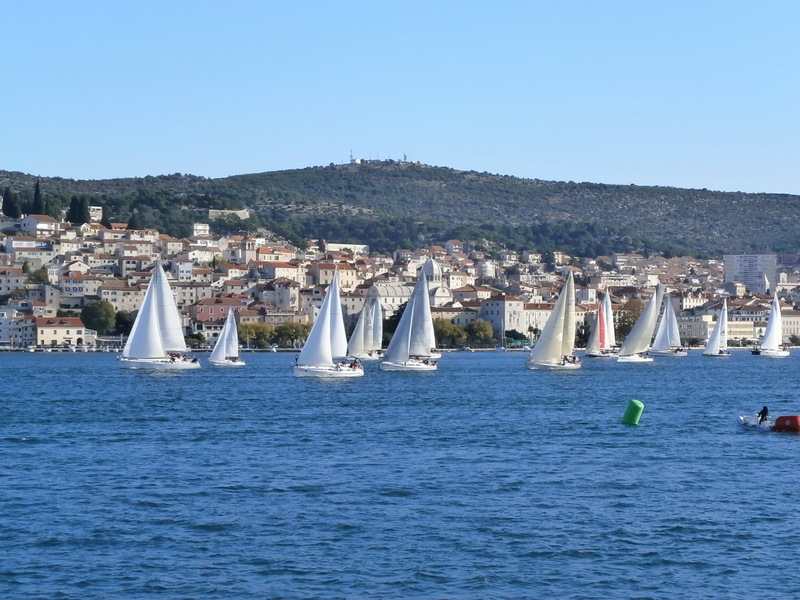 It was a bright and sunny day on the water and the sailboats whizzing around on the water with the centuries old city of Sibenik in the background certainly made this a special experience. Of course seeing Santa water skiing by as the cannon sounded to begin the race or in getting to meet St. Nicholas made this a special occasion and experience anyway. 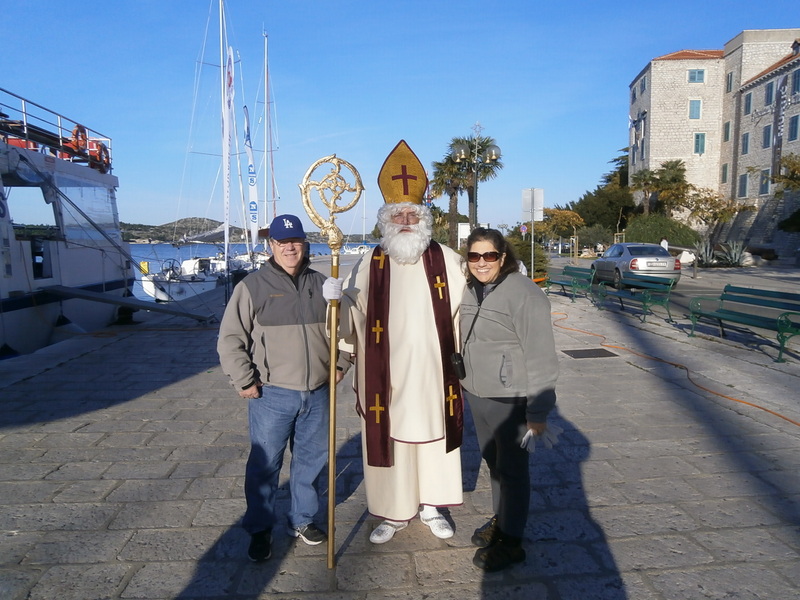 Sibenik is a town of 46,000 residents and many of them were out to enjoy the beautiful winter day and to watch the sailboats parading up and down SibenikBay. This was just one festivity marking the upcoming holidays that is not celebrated back home but which means a great deal to the people of the land we currently call home and we loved sharing this holiday with them in some small way. The Holidays are a time of being with family and friends. What we have learned however is that no matter where we are we do have family and friends with us. They are just ‘new family and friends’ and we feel blessed to have met them along the way as we live as The 6 Monthers. Being in Bosnia-Herzegovina was our first time in a country where the predominant religion was Muslim. What impressed us with our time there was that so many Mosques’ dotted a small area. What also made an impression were the multiple calls to prayer that one can hear around the city via loudspeaker. Since religion has always played a part in my life I have to report that walking around the city of Sarajevo and hearing the call to prayer was in many ways relaxing and calming for me. No, I had no idea what they were saying but the melodic sound of their voices was soothing nonetheless. Mike wanted to see Sarajevo because almost 30 years ago this city hosted a winter Olympics and Mike loves winter sports of all kinds. Mike was a ski instructor back in Washington State and he is an avid outdoorsman and hiker so to get to travel to a location that had hosted an Olympics was special for him. Taking a bus from Mostar to Sarajevo takes a little more than two hours. We again reserved a hotel in the center of old Sarajevo and it was the ideal location to begin our exploration. We dropped off our backpacks and set out to explore the city with maps in hand. Old Town Sarajevo is filled with shops, cafes, coffee houses, bakeries, souvenir shops, history and mosques. We have at least two spires in every photo that we took. Before heading to dinner we came upon a tourism office. 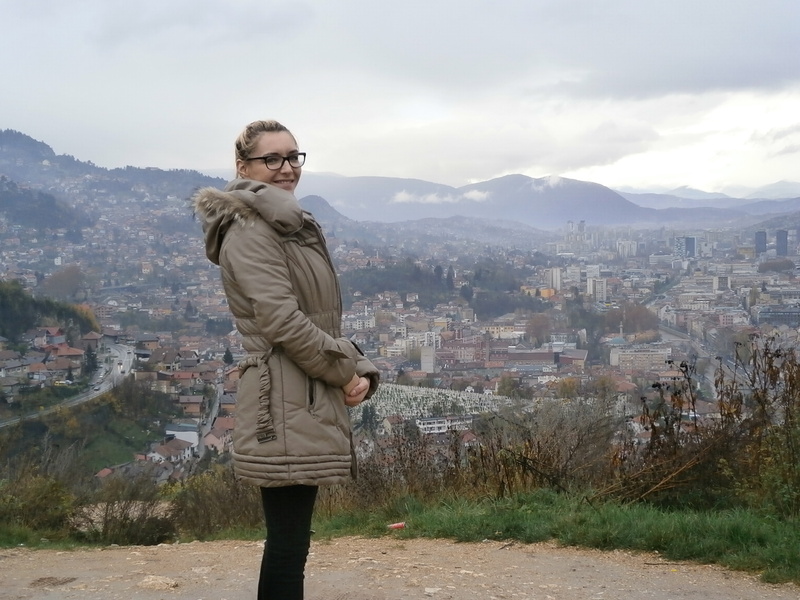 Sarajevo has so much history and to see all the sites we knew we had to hire someone to take us to places we would not be able to get to without a car. Our first day trip was to the town of Srebrenica. Our second was a day tour of the city of Sarajevo itself. Our guide for both days was Dzenana (pronounced jenana), a young and enthusiastic 20 something who like Selmir in Mostar, loves her country. 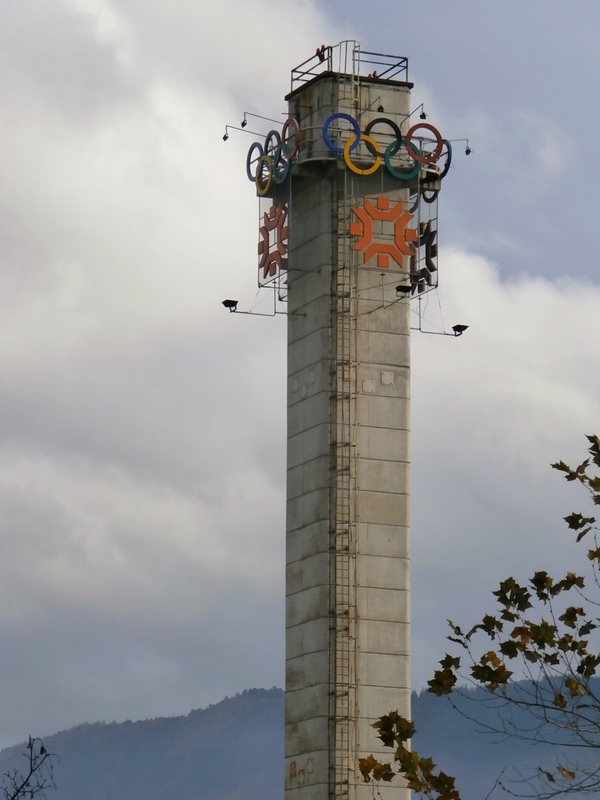 A city tour of Sarajevo is unlike any other tour I have taken in any city I have visited. A tour of this city is filled with references to the war and the destruction that happened during that war. We were shown ‘sniper alley’ and the famous Romeo and Juliet bridge were two young people who were running across the bridge to get away from the fighting were murdered by a sniper; we were shown the National Library that was bombed and which burned for five days destroying 2.5 million documents that were housed here and which had detailed information from the history of the country in it; we learned that a ‘Sarajevo rose’ was the marks left on the ground by the artillery that rained on the city, sometimes as many as 300 of them in a single day; we learned that 300,000 people were trapped inside the city limits during the war many without food, water, heat, or electricity; we were given stats like 11,000 people died in the city of Sarajevo during the war, 1600 of them children; that 1 million refugees left before and during the war and most never returned; that 80 % of the city was destroyed; that Sarajevo was attacked for no other reason than it was an easy target, the aggressors never entered the city they simply staked out the high ground and tossed bombs for three years, their objective to topple the government and break the will of the people, which they never did. We learned that the Olympic Village, where once athletes from around the world stayed and competed in harmony was burned and bombed and it no longer resembles a place of peace and goodwill. 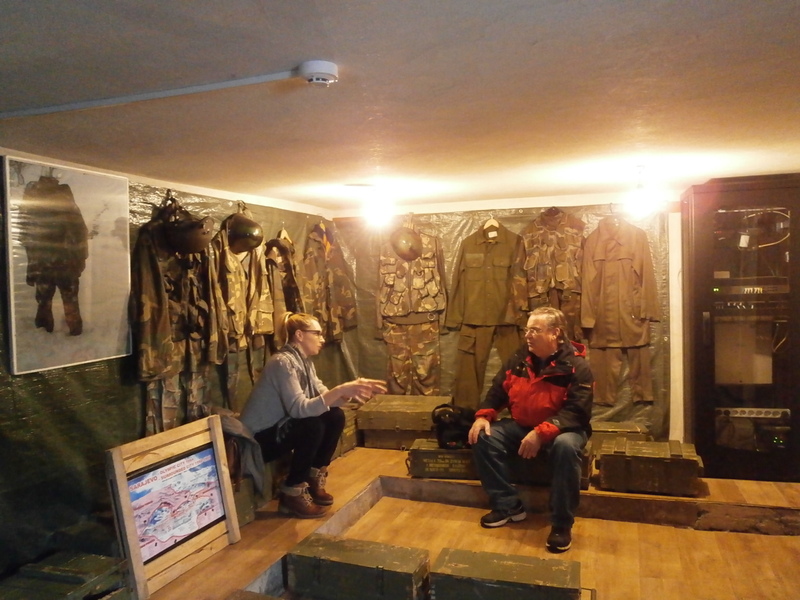 We were taken on a ‘tunnel tour’ where we were able to enter the tunnel that was used to bring in food and water and electricity to those trapped inside Sarajevo during the war. This 800 meter tunnel made the difference in the lives of those people and helped to ensure they had a chance to survive the war. Without that tunnel there would have been no hope. We learned about the hatred and lingering resentment between the people of Bosnia and those who live in the region known as the Republika of Srpska who even today want to become a part of Serbia further splitting away from Bosnia-Herzegovina. Some people never learn. Our guide Dzenana showed us a map of her country and she said, “My country is shaped like a heart, why do they want to tear it apart?” She makes an emotional point. The feeling here however is that someday her country will be further split in two. Until then this little country, shaped like a heart, has a lot of healing to do. I fear it will take generations before the healing takes hold and the bombed out buildings are replaced or rebuilt. No city which wears its war so loudly on its streets; were so many bombed and burned out buildings still dot the landscape can heal. There are too many reminders for the survivors to put the war behind them. 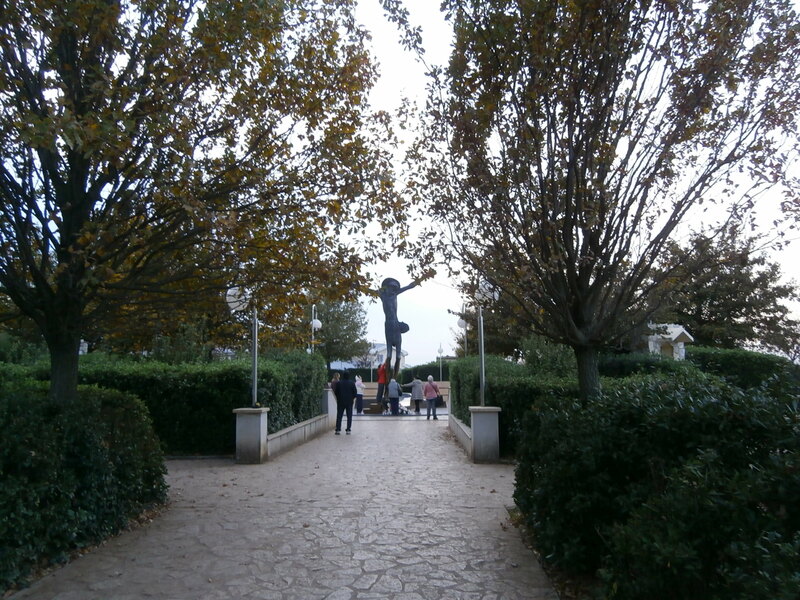 I expected my time in Medjugorje to be emotional. What I did not expect was the sadness I felt in Mostar or the heavy burden of hatred I felt in visiting Srebrenica or the lingering evidence of war still clinging to the streets of Sarajevo. On the bus from Sarajevo back to Croatia Mike and I had time to reflect on all that we had experienced in Bosnia-Herzegovina and ultimately we felt that living there was not something we could do. It would be too hard on us to live in a place were so much sadness still lingers. We only live for 6 months in a new country and that would not be enough time to help heal some of the wounds that have taken years to build, and will take more time than we can give to close that pain. We wish the people of Bosnia-Herzegovina peace. Long and ever lasting peace.